April is officially the “Month of the Military Child.” While I try to tell my kids every day what little heroes they are to me and their dad, it’s nice to see the community showing them support, as well. 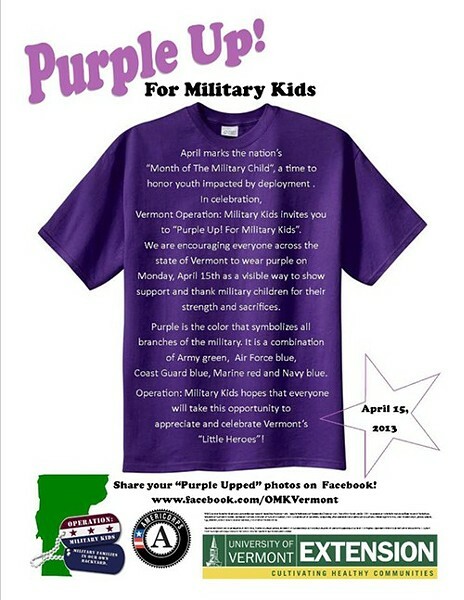 On April 15, Operation: Military Kids is encouraging everyone to “Purple Up” in support of military kids all over Vermont. Would you join us in honoring kids for their service to this country by wearing purple on April 15th? We’d love to see you in your purple! Send a picture to Operation: Military Kids on Facebook to show your support! Tasha Lehman is a mother of three boys living in Vermont. Her husband, Matt, is a first lieutenant in the Vermont Air National Guard who recently headed overseas for his first deployment. The “Home Front: Diaries of a Vermont military family” series chronicles their journey. Read more about their story in February’s “Use Your Words” essay.